This exceptional detached Villa includes five bedrooms, three bathrooms (2 en-suite), full A/C, ceiling fans, cable TV, VCR, DVD, private heatable pool and a fully equipped kitchen. 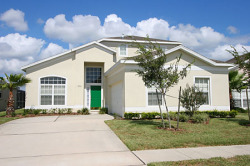 Our house was completed in May 2003 and is prominently sited in the community of Hampton Lakes. Can comfortably accommodate 10 adults with an additional Double Sleeper bed in the Living Room. 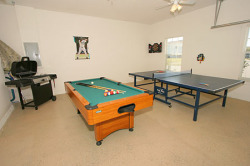 The Games Room includes a Full Size Pool Table and Table Tennis Table plus Computerised Darts Board. Playstation2 is attached to the Lounge TV. complimentary barbecue, high speed internet and enhanced TV channel package (live UK news & sport). It is in the perfect location to visit all Walt Disney theme parks (15 mins away), Universal Studios (30 mins away), Sea World, Busch Gardens and a host of water parks. 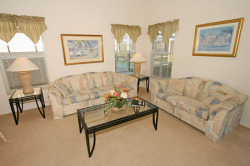 It is near to a range of championship golf courses and is an ideal base for a golfing holiday. 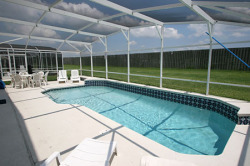 Communal pool, tennis courts, basketball and young children's play area within the estate and close by.